Our office specializes in providing treatment for people with physical, medical, developmental or cognitive conditions which limit their ability to receive routine dental care. Sometimes referred to as Special Health Care Needs (SHCN), they can be any of the following: any physical, developmental, mental, sensory, behavioral, cognitive, or emotional impairment or limiting condition that requires medical management, health care intervention, and/or use of specialized services or programs. Health care for individuals with special needs requires specialized knowledge, increased awareness and attention, adaptation, and accommodative measures beyond what are considered routine. Millions of people live with some form of disability -- 20% of the population, in fact. There are several types of disabilities: intellectual, physical/developmental or a combination of both. Some examples of patients with disabilities may be those who suffer from: multiple sclerosis, autism, downs syndrome, genetic disorders or even childhood arthritis. Disabilities can affect everyday life -- even the smallest actions, such as brushing your teeth, can be problematic for patients with special needs. Oral health is a vital part of general health and overall well-being. 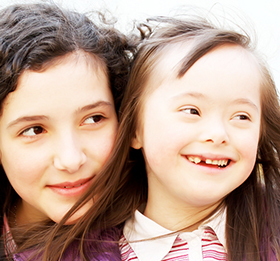 Children with special needs are at increased risk for oral diseases. These diseases can have a direct and devastating impact on the health of children with certain health problems or conditions. Your son or daughter may require special dental health care services. Patients who have trouble practicing oral hygiene need to see their dentist more often to check for signs of dental problems, while others require more attention during the appointment. Dr. Kobil has been servicing SHCN patients for over 22 years; both in her private practice, as well as being an Associate Clinical Professor for the University Of Pittsburgh School Of Dental Medicine, in their pediatric dental department. When scheduling appointments, please inform our staff if your child has any special health care needs. Our office staff, under the guidance of Dr. Kobil, can then determine if your child will need a longer appointment, additional staff, or any extra accommodations. Our goal is to provide you and your child in the most effective and efficient manner possible while keeping him or her comfortable, safe and relaxed. Dr. Kobil would be happy to discuss with you all of the treatment services available at your initial exam.